The usual five episode format is retained, this time featuring Twilight Sparkle in a lead role – she’s nice and all, but I still think Midna is the better Twilight Princess. Anyway, only one episode actually features her as a princess, and it isn’t one of the two-parter episodes actually titled “Princess Twilight Sparkle” from Season 4. What we do have is two season 2 episodes and three season 3 episodes. This is a pretty terrible send off to season 3. I’m over the whole “and Twilight Sparkle was a princess” twist at this point, but it still kind of came out of nowhere. 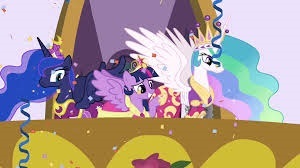 “Jump the shark” is a term that has pretty much no meaning at this point, but one of the original meanings was a moment when the original premise of a show changes suddenly, and that applies here; Twilight is supposed to be learning about friendship before this. Now, I guess she’s got her Doctorate in Friendship Studies. But that’s not the real problem with the episode; it’s kind of stupid to complain about “character growth,” after all. The problem is that it had a really fun premise that is completely botched; when I first heard that the various pony’s destinies were flipped, I was expecting something else. Applejack never left Manehattan! Rainbow Dash completed flight school! I’ll think of something for the other three later! A “what if?” episode. Instead I got a simple cutie mark switch fixed in a song and a half. Oh, and this is a nitpick really, but I had the impression “weather control” was Rainbow Dash’s job, not her talent, which was “flying real fast” (the cutie mark equivalent of an English major, one supposes). Oh, God, and those songs! Not bad on their own, but when shoved up against each other like they were, you just wish they’d shut up! All three problems (the out-of-nowhere sprouting of wings, underuse of an interesting premise, overuse of songs) could have been solved by the simple expedient of expanding this episode to a two-parter. This is a pretty good Season 2 episode, though it suffers from following “Party of One” (a bit better originally, as there was a season break between the two, but if you’re watching the show marathon-style, there’s only three episodes separating them). It’s basically the same, except its Twilight Sparkle going creepily insane over a tiny misunderstanding instead of Pinkie Pie. Pinkie Pie did it first, and did it better. Hey, speaking of Pinkie Pie, here’s an episode that features her instead of Twilight, though Twilight has the largest supporting role. Never mind; this is a fun mystery parody, complete with a Bond parody (hooray!). Also, the super-secret hidden moral of the story is that Applejack is best pony, because she was the only character outside of the two already mentioned who was completely innocent, despite being the first to show signs of wanting to eat the Cakes’ cake. The problem with Trixie is she’s a terrible villain, despite what you might think from her popularity. It’s hardly her characterization that makes her a fan-favorite; her main traits are being blue and a braggart, both of which are covered by Rainbow Dash. No, she made her appearance in an actually pretty terrible episode, which, like everything else in that episode, wasn’t her fault. Yes, she humiliated half the main cast, but technically, she was a stage performer being heckled (rather hypocritically in Rainbow Dash’s case), and hecklers are considered fair game. Given cases in real life of heckling defenses gone wrong, the worst she did was drop the L-bomb. She can hardly be blamed for the Ursa Minor thing; it’s not her fault that two children believed her story about an Ursa Major; after all, she’s a stage magician, i.e. a career based on the audience knowing deception is the entire point. Now we learn that her entire career was derailed by the incidents of that episode, in a universe where career and destiny are one and the same. She finally does something legitimately wrong by blaming Twilight for her woes, despite the fact Twilight was the only character who didn’t heckle her originally. Sure, she grabs hold of an dangerous, corrupting artifact in her (misaimed but not unwarranted) quest for vengeance … which she then uses to throw pies at Twilight. EVIL! Followed by her immediate apology for the whole thing, which was hardly her fault anyway. I don’t know – I think at this point we need a third Trixie episode where she puts on another magic show… where everybody has a fun time and really enjoys the show and tells the poor girl so, the end. Season 3 seemed to be where the writers decided to go ahead and do the plots all shows are required to do at some point by law, apparently. We had the episode where saving someone’s life results in an embarrassing “I owe you my life, so I guess I’ll be your slave forever!” situation. Now we have the episode where the cast is trying to impress someone they haven’t met, and there’s an amusing case of mistaken identity. Not bad as far as these things go, but we’ve obviously seen this one before. This was also part of a weird two-parter with “Just for Sidekicks” – a much more interesting episode. Divorced of that, both ends of this seem like non-sequiturs. I already reviewed this movie, but I’ll say if “Magical Mystery Cure” was a “jump the shark” moment, then this movie, despite what everyone expected, was an “unjump the shark” moment. I’m not sure you can do that, according to official shark jumping rules, but whatever. The DVD features a kinda-sorta pair of making-of featurettes which are kinda-sorta interesting to watch if you’re into that sort of thing, plus, in a surprise twist, sing-along songs and coloring sheets. 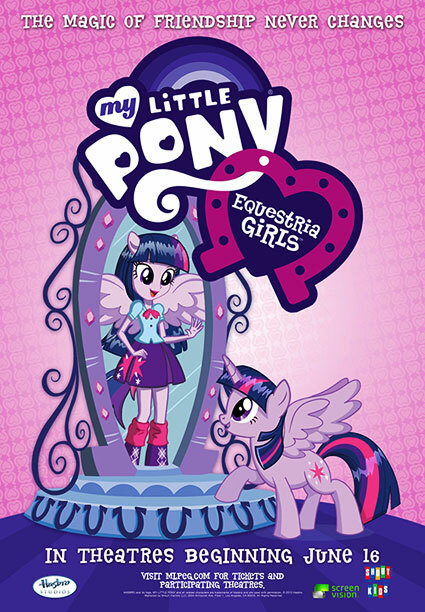 There is also a bizarre trailer for some Hub show I’ve never heard of and a downright disturbing advertisement for what seems to be Equestria Girls brand hair extensions, despite the fact that the show actually made fun of “tail” extensions at one point. Also, I got my copy at Wal-Mart, which featured temporary fingernail decals. I mean, hell, yeah, right? It's always fun to read the Flayrah reviews, since they often go against the received wisdom among fans (bronies, anyway) and that's partly the case here as well. But I'm as pointless a person to comment as any other, so I might as well give it a go! I completely agree that "Magical Mystery Cure" *really* needed two episodes. One for the cutie mark stuff, one for the princess stuff. The gap between the desolation of "I've Got to Find a Way" and the joyousness of "A True, True Friend" was absurdly short. A shame, as I think both those are among the finest songs the show has ever done -- and the recently released extended cut of the first one is better still. Princess Twilight looks a lot better in the light of the generally excellent S4, and I don't think it's coincidental that there's very little objection to her alicornhood these days. "MMMystery..." I really do not like at all, apart from the fabulous parody scenes. The reason is characterisation. I just find it impossible to reconcile the portrayal of Fluttershy, especially, with everything else we've learned about her by this point. It's a long time since I've watched it all through. 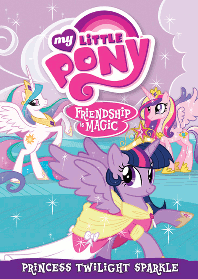 "Magic Duel" -- I'm not a fan of Trixie, so I don't much like this one, though my reasons are different from yours. I know Lauren Faust is no longer directly relevant, but her comment in "The Elements of Harmony" book interview that Trixie *does* have the potential to be a "major villain" means I see her a little more negatively than you do. I'm afraid I'd be quite happy never to see Trixie on screen again. As for "Games Ponies Play", well quite frankly, *yawn*. I didn't actually *dislike* it as I did a certain Spike episode in S3, but by Celestia it was boring. The relatively subtle exploration of claustrophobia was nice, and FS/RD's "Boom-cha!" too, but not much else other than a few brief gags. Not, in a million years, a classic episode. The access denied link is my fault; there's a story in the queue about it that hasn't been published. You'll see it when it is!